How do we fill the gaps in care for street-involved youth with mental health challenges? SARAVYC is pleased to announce the release of its newest community report, "Four Organizations Partnered to Address Youth Homelessness in Vancouver". 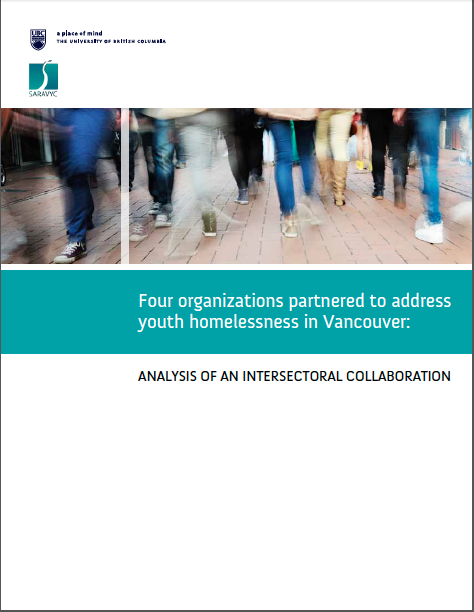 This report details the process of intersectoral collaboration between St. Paul's Hospital Inner City Youth Program, Covenant House Vancouver, Coast Mental Health, and BC Housing, from a study SARAVYC undertook, funded by Human Resources & Social Development Canada. To read more about the successful collaboration, and what strategies others can use to work together across sectors, see the report.